Ussher Fort is a fort in Accra, Ghana. It was built by the Dutch in 1649 as Fort Crèvecœur, and is a day's march from Elmina and to the east of Accra on a rocky point between two lagoons. It was one of three forts that Europeans built in the region during the middle of the 17th century. [Note 1] Fort Crèvecœur was part of the Dutch Gold Coast. The Anglo-Dutch Gold Coast Treaty (1867), which defined areas of influence on the Gold Coast, transferred it to the British in 1868. Negotiations to build a Dutch fort on the site began in 1610, but did not bear fruit until much later. Fort Crèvecœur was built in 1642 as a simple factory and then enlarged in 1649 by the Dutch West India Company. It was named after Fort Crèvecœur in 's-Hertogenbosch in the Dutch Republic, which had played a crucial role in the Siege of 's-Hertogenbosch. One of the Dutch representatives, Henry Caerlof, developed good relations with the Dey of Fetu, who gave Caerlof permission to build Osu Castle in 1652 for the Swedish Africa company. Fort Crèvecœur and Fort James were neither as imposing nor as important from the political point of view as Elmina or Cape Coast Castle, built 150 kilometers further west. Still, they brought their owners significant revenue. At the end of 1781 Captain Thomas Shirley in the frigate HMS Leander, together with the sloop-of-war Alligator, sailed for the Dutch Gold Coast with a convoy consisting of a few merchant-vessels and transports. Britain was at war with the Dutch Republic and Shirley launched an unsuccessful attack on 17 February on the Dutch outpost at Elmina, which the Dutch repulsed four days later. Leander and Shirley then went on to capture the small Dutch forts at Mouri (Fort Nassau - 20 guns), Kormantine (Courmantyne or Fort Amsterdam - 32 guns), Apam (Fort Lijdzaamheid or Fort Patience - 22 guns), Senya Beraku (Berricoe, Berku, Fort Barracco or Fort Goede Hoop - 18 guns), and Accra (Fort Crèvecœur - 32 guns). Shirley garrisoned those facilities with personnel from Cape Coast Castle. Fort Crèvecœur, which lies to the east of the present port, became known in time as Ussher Fort in honour of the then Administrator of the Gold Coast, Herbert Taylor Ussher. In all, Europeans built 27 forts on the coast of Ghana. The Dutch captured two forts from the Portuguese, and themselves built nine others. The British built ten, all before 1660. Today, only 11 of these forts are in good shape. Ussher Fort is currently being restored with funds from the European Commission and UNESCO. The purpose is to convert it to a museum and International Documentation Centre. ^ The other two were Osu Castle (Fort Christiansborg; Danish, 1652) and Jamestown, Ghana (Fort James; British, 1673). ^ Kropp Dakubu (1997), p.147. ^ a b Van Dantzig 1999, p. 24. ^ Soulillou & Salvaing, p. 149. ^ Crooks (1973), pp.51 and 62. ^ An Introduction to the History of West Africa, Cambridge University Press. 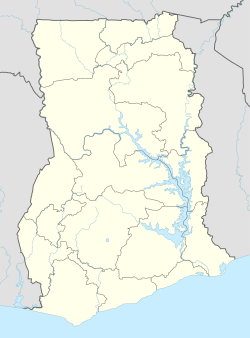 Wikimedia Commons has media related to Fort Crevecoeur, Accra. Kropp Dakubu, Mary Esther (1997). Korle Meets the Sea: a sociolinguistic history of Accra. Soulillou, Jacques and Françoise Doutreuwe Salvaing. Rives coloniales: architectures, de Saint-Louis à Douala. This page was last edited on 21 May 2018, at 20:01 (UTC).